By now you may have learned that there was a shooting in Pittsburgh last night, and several people were killed and even more were injured. The shooter was one of the dead. He was a single, middle-aged IT professional at a large Pittsburgh law firm. Despite the legal connection, that doesn't normally qualify as newsworthy for this space. However, Above the Law discovered a troubling online diary by the shooter that detailed, long in advance, his intentions to take his life and to take others with him. I spent a few moments reading the diary and it was tragic and sad. I imagine it will be pulled offline at some point, but one doesn't have to read it all to realize this was one very troubled guy sorely in need of professional help. In the diary he discusses the several rounds of layoffs taking place at his law firm. He appeared to understand the necessity of the first round, but with each subsequent round his temper flared as he was convinced he would unfairly lose his job. Ironically, he survived all the layoffs and was even recently promoted. But this didn't deter him from his course. 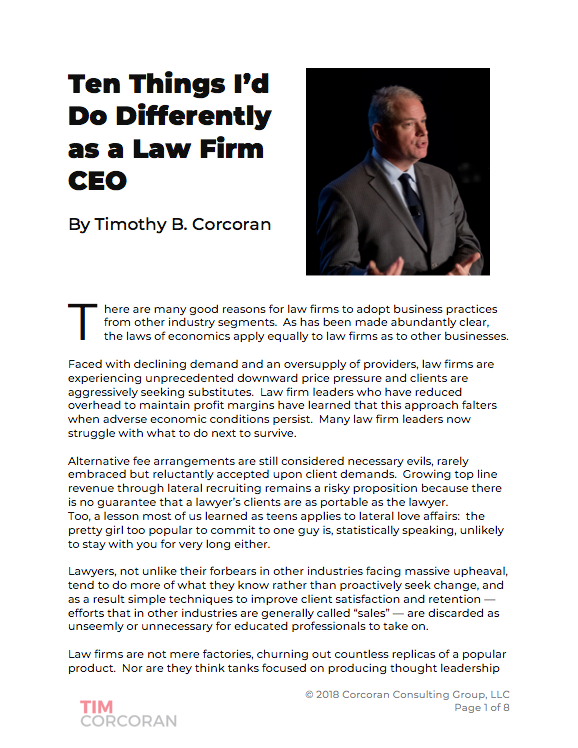 I've written at length in this space and elsewhere about the need for reform in the legal marketplace. Whether it's large law firms' colossal inefficiency and feigned client focus, corporate law departments' tendency to complain without taking action, or the large divide between legal vendors' great products and their fumbling and sophomoric execution, there are plenty of teachable moments to choose from. These issues existed long before the recent global economic downturn, but the challenges are now more acute and finally we're seeing organizations taking long overdue action. However necessary it might be from a macroeconomic perspective to cull the ranks of underperformers, or outsource tasks or entire functions to lower-cost suppliers, or stop doing business altogether with poor suppliers, there is always a real cost to the man on the street. Opinion polls may confirm that most Americans feel the automotive and health care systems are in need of an overhaul, and all of us would like to spend less for a doctor visit or a new car, but it has a whole different meaning when someone you know or care about loses his livelihood as a consequence. In the legal marketplace, demand for legal services is undeniably down and so the logical reaction is to eliminate excess capacity. This means idle lawyers and staff are let go, in the same way that gas guzzling SUV manufacturing plants were idled and workers sent home during the recent gas price crisis. This makes sense from a business perspective. But let's not lose sight of two important considerations: there's a right way to let people go, if not for their sake then for the organization's reputation; and owners and managers whose incompetence or inattention contributed to poor performance shouldn't get a free pass while others suffer. Some businesses have increased sensitivity to these optics, while others remain blind. So without delving into the reasons why, for the purposes of this exercise let's stipulate that the correct course for a business is to lay off a handful of employees. How should this be accomplished? Look, I'm not a credentialed and certified human resources professional, whatever that might be. I've worked with far more over-promoted buffoons in senior HR and personnel roles than those whose contributions demanded respect. I've sat in board rooms with senior vice presidents leading the corporate HR function who couldn't articulate the company's value proposition, name more than 1 or 2 products, identify a competitor or tell the difference between NPV and NOC. Yet because layoffs are messy affairs we turn to them to run the show. Large law firms, who time and again hire middle managers from the corporate sector and give them senior titles and responsibilities, or promote valued employees from functions where they excel to functions they know nothing about, shouldn't be surprised when these duties tax their capabilities. Years ago a fellow manager and the head of HR conspired to lay off one of my colleagues. This 18-year veteran, whose primary failing was allying with the wrong political faction, and whose contributions included training all salespeople, including every top performer for the prior 10 years, was given 15 minutes to collect her personal items into a box, with building security hovering conspicuously in the open doorway, and then escorted to her car at midday in full view of the lunchtime crowd. There was no particular reason to fire her on that day and at that hour, but due to an obvious lack of compassion and perhaps a bit of a mean streak, they chose a timetable and an approach guaranteed to obliterate any sense of dignity left in this loyal employee. Some years later a new head of HR, smoother on the outside but just as inept, counseled managers to conduct the periodic terminations on their own, then hid in her office as they took place. When it came time to fire one of her own direct reports, she flew in another subordinate to do the deed! The point is that the supposed experts don't have a perfect formula. I've had to terminate or layoff multiple people over the years, and I relied primarily on common sense. My experience might be helpful. Performance metrics should be standard across the business and should be compiled long before the layoff. I've been asked to participate in a charade where managers evaluate and rank layoff candidates who have been previously, and sometimes mysteriously, identified. The task is ostensibly to pick the poor performers but the real intent is to have a paper trail showing proper due diligence, which presumably insulates the organization from charges of unfairness, discrimination or wrongful termination. The problem is, the easily discoverable paper trail also shows that the managers only evaluated the likely candidates, not all employees. A little selection bias perhaps? Also, there is quite often disparity between an excellent performance review conducted some months prior and a sudden and undocumented downturn in productivity. If the organization has a performance management system, use it! Measure and track performance on a regular schedule, use a consistent methodology, and don't shy away from capturing tough comments when performance is sub-par. Law firms are criticized for allowing powerful partners to protect their favorites, using vague performance measurement criteria if at all, but the fact is this behavior is prevalent in the corporate sector as well. The best way to eliminate favoritism and truly identify poor performers is to implement and adhere to a standard evaluation process. And use this as the basis for the layoff, not a new, isolated and suspect vetting process two weeks before the termination date. Don't confuse poor financial performance with poor job performance. Let's be clear: sometimes -- whether through our own missteps or due to market turmoil -- a reduction in the workforce must take place, even though those affected haven't been poor performers. It's unprofessional and caustic to an organization's reputation to label financial victims as poor performers. Call a spade a spade and move on. There are few stakeholder groups -- clients, the press, alumni, recruits, etc. -- who will harshly judge the organization for declaring that "Demand in our core market sectors has declined to a point where we must reduce excess capacity and unfortunately let some of our valued employees go" rather than the obvious fabrication "While our competitors and clients are suffering we are doing quite well, thank you, but we coincidentally decided to use this time to terminate the many poor performers who have somehow escaped our notice previously." Layoffs are costly, so expect to spend a few more dollars to do it right. In the long-run, the intention is to save the ongoing payroll and benefits costs of the departed employees, so offsetting that savings with outlandish severance packages isn't sensible. But neither is conspiring to shave every cent off the severance package to save a few dollars. I've had to negotiate with fellow managers and HR professionals over half-days of vacation, an extra month of pay for a long-time employee who had the misfortune to be laid off just before a pivotal anniversary date, and whether to pay a package at all when the departed employee was lucky enough to find a new job before all the paperwork was signed! I'm well aware of the tired HR objection that on an individual basis doing the right thing seems cost-effective, but on an aggregate basis the costs become unwieldy. But even a cursory read of the many books on viral marketing and customer service reveals that a happy workforce, happy alumni, happy clients, serve as multipliers to the firm's own marketing and sales efforts. Imagine the low cost of sales when a valued former employee who left with her dignity intact ends up in a new role with influence or even decision authority over the purchase of her former employer's services or products. It really all comes down to dignity. It's appalling the manner in which good people, otherwise unsullied by a vindictive nature, turn on their former colleagues when it's time to let them go. I've let people go in person and on the phone, one-on-one and in a group setting, so there's no perfect approach. Open, honest communication should acknowledge the potential trauma and disruption, while firmly guiding the employee to the inevitable conclusion. There should be a script to ensure that the key points are covered, but it's okay to go off-script and address unforeseen questions. However, there's a point at which compassion becomes drama. I learned of a fellow manager who dissolved into tears as she terminated a long-time employee. The terminated employee ended up consoling the manager who was too distraught to proceed. In my view, the wrong person was shown the door that day. Let's close by addressing directly the circumstances that our Pittsburgh shooter calls to mind, that a terminated employee will become violent. This is a real dilemma. Does the organization build all termination procedures around such an extraordinarily unlikely outcome, meaning that security guards are on hand, and terminated employees do a perp walk as they depart? What impact do such measures have on the departing employees who don't deserve such treatment? The risk of getting it wrong is potentially high, as evidenced by the occasional anecdote of a disgruntled employee becoming violent in the workplace. But the earlier point about misguided fairness applies here as well: conduct a risk assessment of the terminated employees and handle the exit discussions differently with some; everyone doesn't have to be treated in the exact same manner. This discussion refers to making rational but compassionate choices when conducting the inevitable layoff. I don't purport to provide legal advice on what approaches are more or less likely to generate an accusation of wrongful termination. The underlying thesis is that organizations taking the high road, that find ways to marry sound business judgment with compassion for employees and clients, will generate better financial returns and maintain a positive image in the marketplace. There are plenty of examples of organizations performing poorly in these situations. If you are involved in planning for a layoff, tack a photo of your kindly grandfather, your beloved mother, and your free-spirited child on the bulletin board. As you plan each action you're about to take, consider how you'd explain yourself to them. Better yet, consider how you'd feel if one of them called you to describe the manner in which they were laid off today. There are pretty good odds that this conversation will take place at some point... though I can't predict whether you'll be the one making or receiving that call. Welcome to Law Firm, Inc.